Apart from the numerous times I escaped out the toilet window, slipped out the school gate, crossed the road, and broke back into my own home, these lines are probably the happiest memory I have from my first year of Primary school. 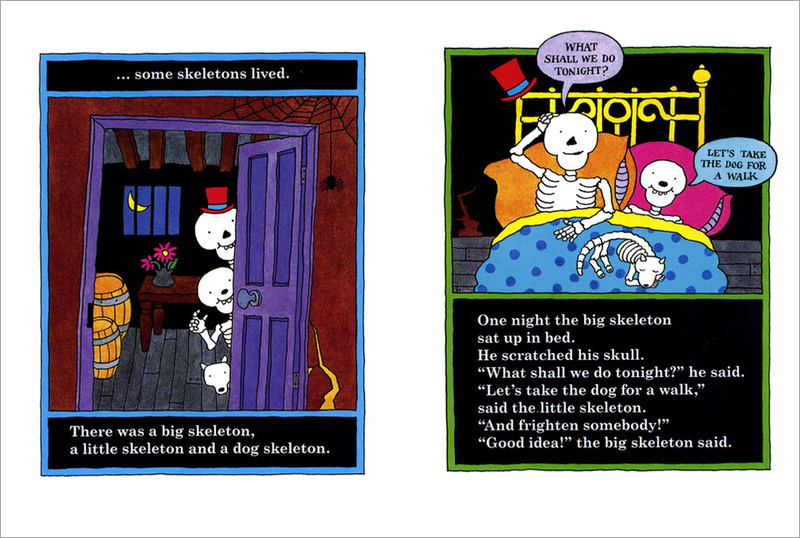 Janet and Allan Ahlberg’s Funnybones was the book that first introduced me to the delights of spooky stories. My long suffering teacher Miss Janssen reading those opening lines with the required amount of dread. I’ve loved horror stories ever since, and have done my level best to introduce my kids to the pleasures of a good bit of fear. Admittedly I did go a bit far a few Halloweens back when I took them both to a deserted cemetery and jumped out from behind a gravestone. This year we’ve played it safe by reading some dark dark house classics instead. He who must not be named never comes out too well in that particular role play. Though not as badly as poor Doctor Mouse in Jan Pieńkowski’s pop-up classic Haunted House. Last week I wrote about the perfection of the plot in Roald Dahl’s Fantastic Mr Fox. Well, Haunted House is just as beautifully plotted, but it in pop-up format – a genre not usually allied to the subtleties of storytelling. Pieńkowski entices you from the front cover, a cheeky tentacle hanging out of the letterbox and invitation to ‘Let yourself in’. Once in the hallway we are led through a series of B-movie horror set-pieces; past the picture with the moving eyes, the gorilla popping out from behind the sofa, the alien crashing through the bathroom wall, the skeleton leaping out of the closet… It’s all undercut with an ironic conversation between two mice, moaning about their aches and pains, before the terrible unseen conclusion. 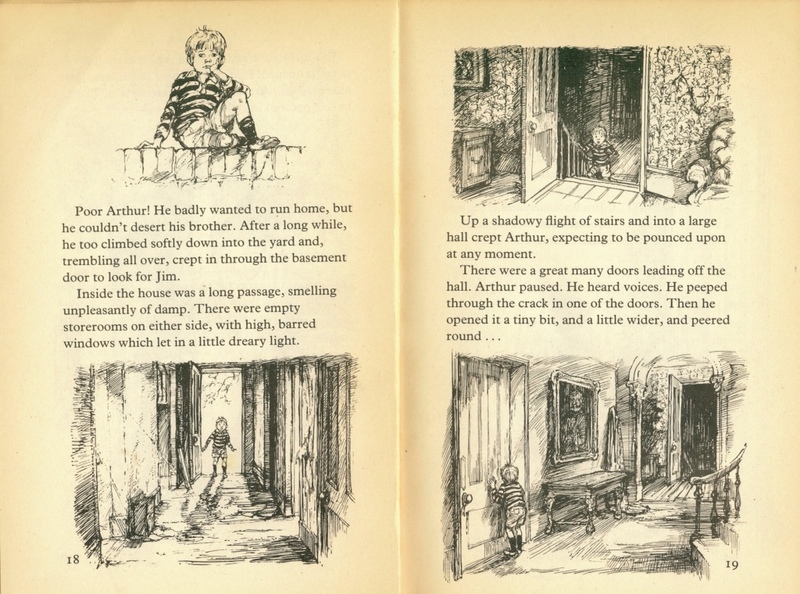 Shirley Hughes isn’t really someone you’d normally connect with the horror genre. She’s best known for showing us the world through the eyes of very young children. Their dramas are the everyday; starting school, losing a soft toy, or getting locked inside the house with the grown-ups on the other side. ‘It’s Too Frightening For Me’ is a story about two brothers unable to resist poking around a dark house. 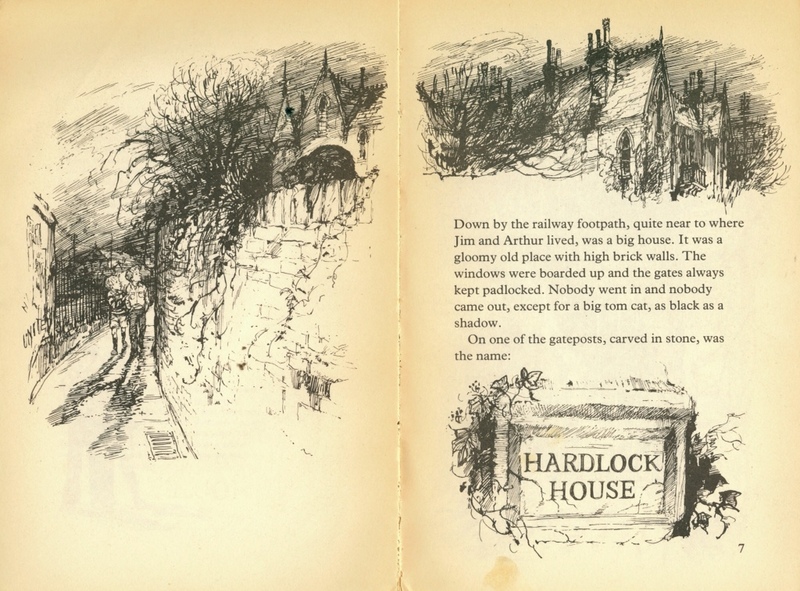 It provides the scares, but retains Shirley Hughes’ wonderful empathy for her characters. You get a real sense of the boys fear as they try to put on a brave face, pushing themselves that bit further each time they return to the house. The scene where Arthur looks for his big brother in the shadowy hallways is particularly effective. They find themselves embroiled in the lives of the unusual residents and wind up foiling a dastardly plot, with an unmasking – or rather unwigging – worthy of Scooby Doo. There’s a great sight gag in the last pages showing the offending hairpiece weaved into the tangle of vines outside the house by nesting birds. 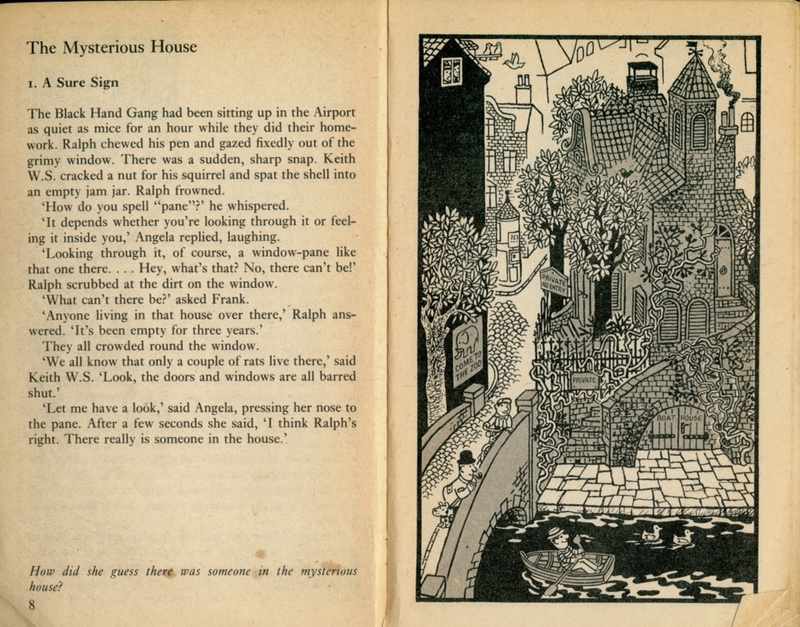 Mysteries also abound in The Adventures of the Black Hand Gang by H.J. Press. There’s nothing horrific to be found here, but it does have a mystery on every page for the reader to solve by studying the intricate illustrations. The Black Hand Gang are a group of children and their squirrel running a detective agency from their bedroom. The first case sees them exploring a mysterious dark house, and uncovering a forgery business operating out of the basement. H.J. 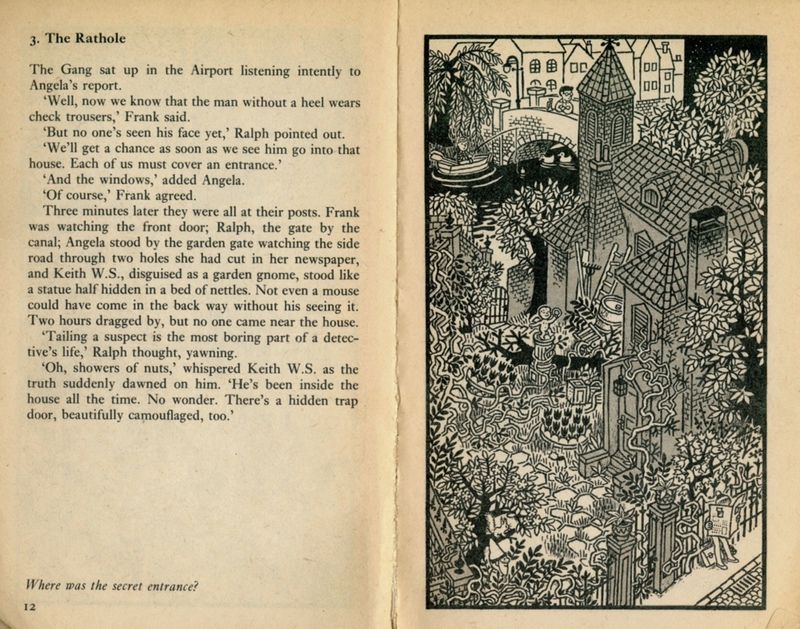 Press was a German writer and illustrator, and I think it was the moody european settings that captured my imagination as much as the puzzles. It’s a bit like Where’s Wally realised by Hergé. 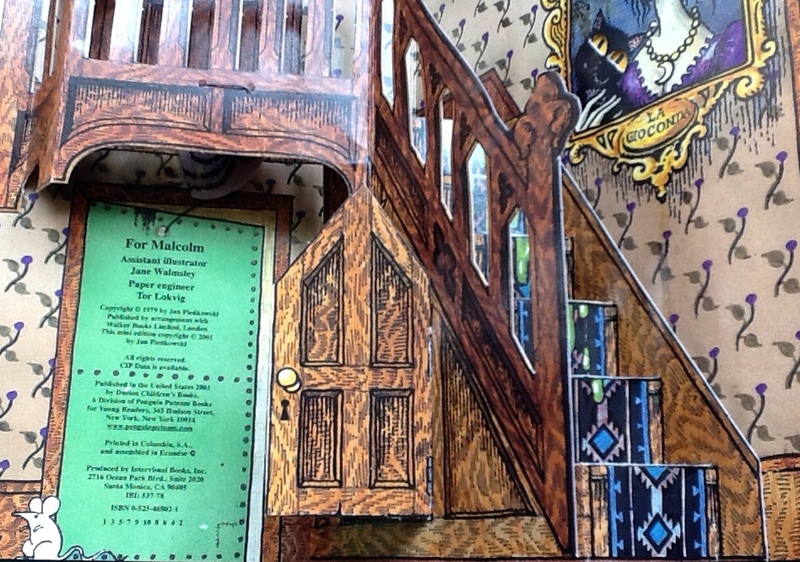 Tags: Halloween, Harry Potter, Haunted House, Jan pienkowski, Shirley Hughes. Bookmark the permalink. Brilliant to see It’s Too Frightening For Me featured here – it’s a terrific read, one of my top SH faves; I will print this out and pop it in the post to her. Exciting! Hope Shirley likes it – feel as though I should have checked my grammar a bit more carefully now!